I am not a particular fan of Billy Bragg or Wilco, both of which have already been on this list. I must, therefore, presume that it is the Woody Guthrie element that brought this up in my consideration. Bragg and Wilco collect a number of new Guthrie songs, so if you know his back catalogue you might not be familiar with these and they are well worth listening to. Some songs are better than other of course... I don't like Hoodoo Voodoo for example, but it is overall a great selection. The songs run through a variety of styles and the arrangements done by Bragg and Wilco work pretty well, even if they are sometimes more reminiscent of The Band than they really should be. However, Guthrie was also an influence on The Band and particularly Bob Dylan, so this might just be a tribute. Great Stuff. During the spring of 1995, Woody Guthrie's daughter Nora contacted English singer-songwriter Billy Bragg about writing music for a selection of completed Guthrie lyrics. Her father had left behind over a thousand sets of complete lyrics written between 1939 and 1967; none of these lyrics had any music other than a vague stylistic notation. According to Bob Dylan's autobiography, Chronicles, Woody Guthrie offered his unpublished songs to Dylan, but the young singer was unable to get them from Guthrie's family (he tells a story about a reluctant babysitter). Nora Guthrie's liner notes in Mermaid Avenue indicate that it was her intention that the songs be given to a new generation of musicians who would be able to make the songs relevant to a younger generation. Nora Guthrie contacted Bragg, who in turn approached Wilco and asked them to participate in the project as well. 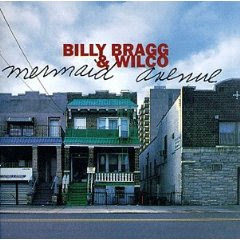 Wilco agreed, and in addition to recording with Bragg in Ireland, they were given their own share of songs to finish.